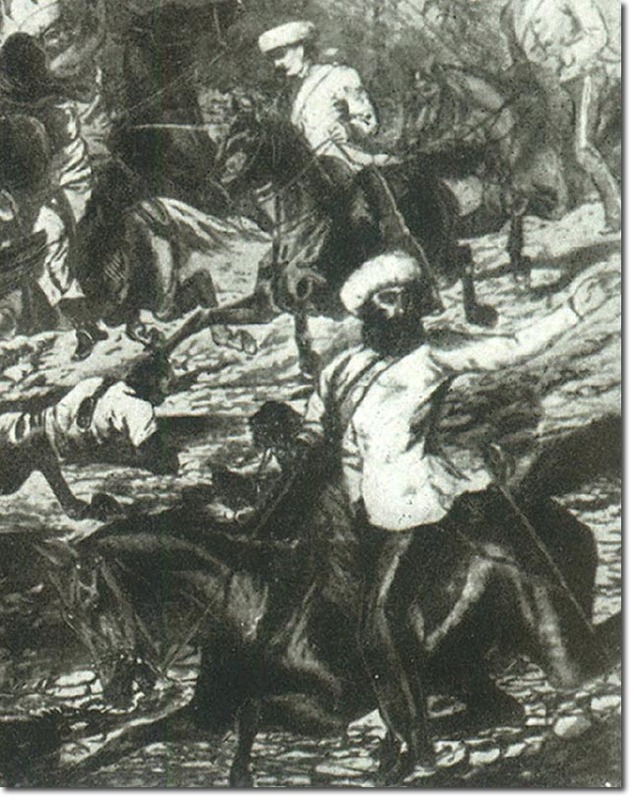 This picture of Russell is a detail taken from a drawing of the 7th Hussars fighting on the River Raptee. The artist was Lieut-General H Hope Crealock. Russell rushed forward to halt the charge to prevent further loss of life at it was discovered that the river had hidden dangers. The action took place on 29th Dec 1858 and Sir William Russell was the commanding Officer, having taken over from James McCaul Hagart on 12th Nov. He is dressed in a white jacket and blue trousers with a yellow or gold stripe. He is full bearded and he has a white turban or pagri. His pouchbelt appears to be the dress version with gold lace and red edges. He was born in 1822 the eldest son of the first Baronet Russell, also Sir William. He succeeded to the baronetcy in 1839 and joined the 7th Hussars as a cornet on 2nd July 1841. He was CO of the 7th from 12th Nov 1858 but exchanged to the 14th Hussars on 8th Oct 1861 where he commanded until 29th Nov 1864. He had served in the Crimea on the staff, and throughout the Indian Mutiny with the 7th. Other appointments included ADC to the Lord Lieutenant of Ireland from 1847 to 1852, and again in 1854. He was Master of the Horse in Ireland from 1848 to 1851 and MP for Dover 1857-9 and Norwich 1860-74. He reached the rank of Lieutenant-General when he retired in 1881, and he died in 1892.